524 pages | 206 B/W Illus. The need for economically feasible and multifunctional materials becomes more acute as the natural physical and chemical resources reveal either their limits or reveal the difficulties and increasing costs in storage, transport, and conversion. 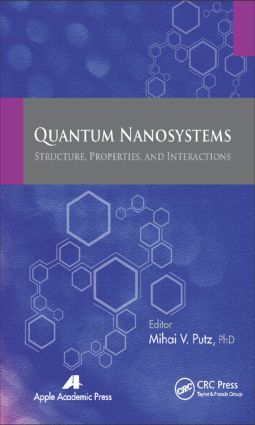 This reference presents the work from contributors from various fields, of various ages and from different countries, creating a valuable collection of research that will advance the fundamental and innovative techniques of nanosystems and their interactions. The authors cover self-assembly, self-regenerating, storage, and directional properties of intelligent materials. It helps readers respond to the challenges in this field. Mihai V. Putz is a laureate in physics (1997), with an MS degree in spectroscopy (1999), and PhD degree in chemistry (2002), with many post doctorate stages: in chemistry (2002-2003) and in physics (2004, 2010, 2011) at the University of Calabria, Italy, and Free University of Berlin, Germany, respectively. He is currently Associate Professor of theoretical and computational physical chemistry at West University of Timisoara, Romania. He has made valuable contributions in computational, quantum, and physical chemistry through seminal works that appeared in many international journals. He is actively promoting a new method of defining electronegativity, DFE (Density Functional Electronegativity), among new enzyme kinetics (Logistic Enzyme Kinetics), and of new structure-activity relationship (SPECTRAL-SAR) model for a unitary quantum approach of the chemical reactivity targeting the bio-, pharmaco-and ecological analytical description. Recently, he is Editor-in-Chief of the International Journal of Chemical Modelling and the International Journal of Environmental Sciences. He is member of many professional societies and has received several national and international awards from the Romanian National Authority of Scientific Research (2008), the German Academic Exchange Service DAAD (2000, 2004, 2011) and the Center of International Cooperation of Free University Berlin (2010). He is the leader of the Laboratory of Computational and Structural Physical Chemistry at Chemistry Department of West University of Timisoara, Romania, where he conducts research in the fields of quantum chemistry and quantitative-structure activity relationships (QSAR). In 2010 Mihai V. Putz was declared through a national competition the Best Researcher of Romania.